The US Office of Naval Research says that it has successfully tested a new type of explosive material that can dramatically increase weapons' impacts. Missiles made from the high density substance can explode with up to five times the energy of existing armaments. The material mixes metals and polymers and is said to be as dense as steel but have the strength of aluminium. US Navy scientists say that projectiles made from the new compound are less likely to kill innocent bystanders. Missiles, artillery shells and other military munitions are normally constructed with a steel casing that simply contains the high explosives within. This new approach from the US Office of Naval Research replaces the inert casing with High-Density Reactive Materials (HDRM) that combine and explode only when the projectile hits the target. According to navy researchers, recent tests have shown that the HDRMs are durable and significantly enhance the explosive effect. They increase the chances of what the military scientists term a "catastrophic kill". Clifford Bedford, a researcher involved in the development of the new material, explained its advantages over existing weapons. "In the case of a steel missile you explosively launch it, it goes through the target and all the kinetic energy is dissipated into the target," he said. "With the reactive material missile, you have the same explosive launch - however, it disintegrates within the target and liberates chemical energy, and this chemical and kinetic energy combined gives you the enhanced effect." The new material has been in development for more than five years and is made from different types of metals combined with oxidizers to create a chemical explosion on impact. Dr Bedford says HDRM might initially be deployed in anti-missile systems as the shrapnel would have considerably greater explosive power to destroy an incoming projectile in mid-air. "In the existing scenarios we have now, we essentially fire twice, look, and fire again because we don't have a great deal of time to hit that missile - and that's because with the steel fragments in current warheads, you can't really tell if you've hit the target or not," he said. 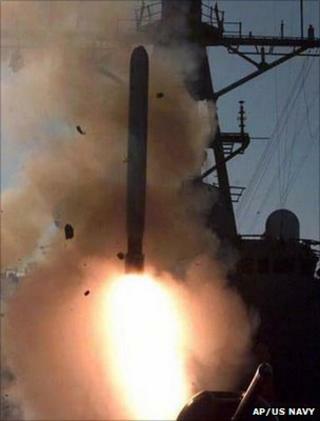 "Hopefully, with the reactive warhead, we fire once, look and can determine a catastrophic kill. We still have the option for a second fire. But it saves a great deal of cost if you can take out the target with one missile versus three." Because the new material reacts and explodes on impact, Dr Bedford believes it could cause fewer casualties among innocent bystanders. "Because it is actually consumed when it hits the target, the collateral damage effects are somewhat minimised. If this can be focused, which I know we can do, we can really reduce the collateral damage for these systems," he suggested. The researcher says the materials could ultimately be applied to grenades and bullets as well as larger weapons. "I wouldn't want to go to [the] regular M16 rifle, no; but in higher calibre machine guns, they are definite possibilities," Dr Bedford explained. Further tests of the system are planned for September. But with a price tag three to four times greater than current technologies, budgetary restrictions may hinder their future use. Dr Bedford says that decision is out of his hands: "Deployment is going to require a political answer, when budgets allow, and that's unfortunately beyond my pay grade."